Fees: 1 day CHF 70, 2 days CHF 120. Concessions for members of visarte: 1 day CHF 40, 2 days CHF 60. Please register by 14. August 2017: tagungssekretariat@gmail.com. Spaces are limited, registration on a first come-first serve basis. Registrations after 20 August 2017 will be charged CHF 40 extra. In the Autumn of 2007 the conference Repository Museum? Strategies for artists’ estates [Endlager Museum? Strategien im Umgang mit Künstlernachlässen] was organized by the Kunstmuseum Thurgau together with visarte.schweiz and the Association of Swiss Museums (VMS), which initiated a broad discussion of artists’ estates for the first time. 10 years later the Campus der Künste in Basel brings together specialists to discuss the still urgent topic. Lectures, workshops and talks will explore the developments of the past decade. What is today’s status of preserving estates? Which individual projects were realised? What needs to follow suit? The symposium organized by the Swiss Institute of Art Science (SIK-ISEA), visarte.schweiz, ARTexperts and the Christoph Merian Foundation is intended to stimulate a varied discussion among artists, estate owners and executives executives, as well as all other committed art business practitioners. 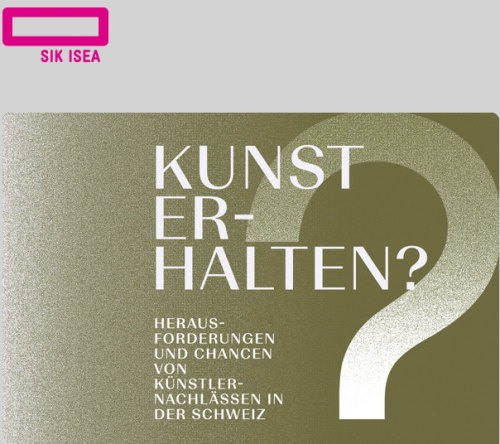 During the conference SIK-ISEA will release its new guide to Artistic Estates.